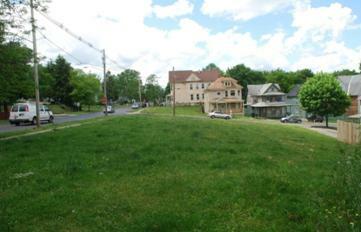 The Vacant Lot Project at 1344-50 West Onondaga Street involved the installation of an urban forest and rain garden. 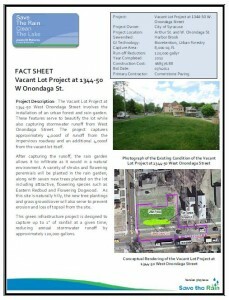 These features serve to beautify the lot while also capturing stormwater runoff from West Onondaga Street. 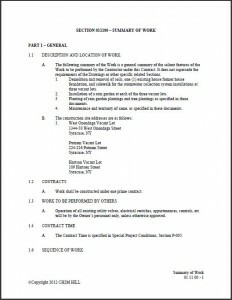 The project captures approximately 4,000 square feet of runoff from the impervious roadway and an additional 4,000 square feet from the vacant lot itself. After capturing the runoff, the rain garden allows it to infiltrate as it would in a natural environment. A variety of shrubs and flowering perennials were planted in the rain garden, along with seven new trees planted on the lot including attractive, flowering species such as Eastern Redbud and Flowering Dogwood. As this site is naturally hilly, the new tree plantings and grass groundcover also serve to prevent erosion and loss of topsoil from the site. 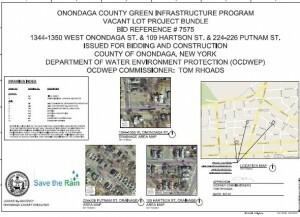 This green infrastructure project captures up to 1” of rainfall at a given time, reducing annual stormwater runoff by approximately 120,000 gallons.